Shadism is a form of skin tone bias that identifies groups and individuals on the basis of degree of skin pigmentation. It is an evaluation of people that minutely registers traits such as skin color, hair, and facial features to construct social hierarchies. For example, in the context of social apartheid in Brazil, and elsewhere in Latin America, people with pale skin, tall stature, light eyes, dark and very straight or light and straight or wavy hair, and aquiline noses are considered more beautiful, powerful, influent and good-natured than people of European and Middle Eastern descent with other phenotypes, and those are of greater status than lower and middle-class people of Asian descent in social hierarchy, which also gives preference to multiracials (Pardos, mestizos, etc.) whose features more closely touches the idealized Northern and Western Europeans in comparison to those whose facial features, hair texture and skin color more resemble the Africans, or whose facial features and stature more resemble Amerindians, the latter associated with savagery, uneducation and superstitions. 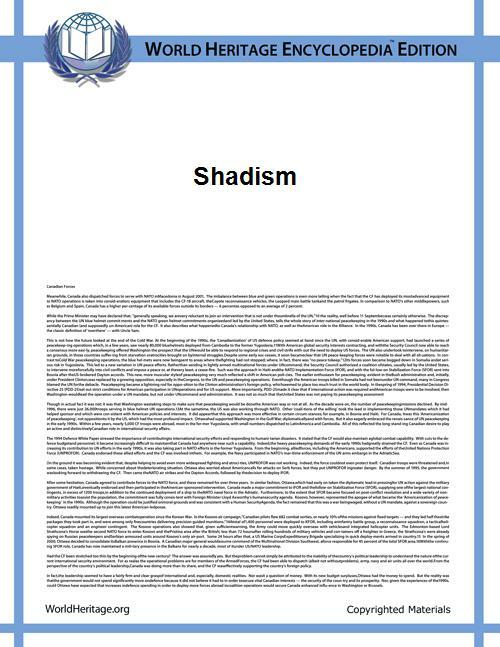 Shadism is closely related to 'colorism', an associated practice that is the manifestation of an internalized, colonial-induced racial self-hatred. This sociology-related article is a stub. You can help World Heritage Encyclopedia by expanding it.